When you’re nominated for 4 Grammys and you actually win every one of them, chances are you’re gonna have that winning glow. 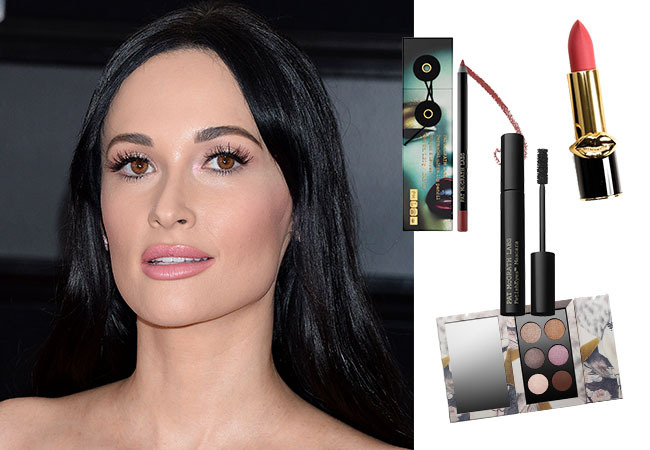 Musical sensation Kacey Musgraves’s “Golden Hour” album swept the show, and not only was the brunette beauty a major winner on stage, she also gave us butterflies on the red carpet. To coincide with Kacey’s ethereal Giambattista Valli couture gown, makeup artist Moani Lee created a beautiful neutral toned makeup up look, with an incredible lit from within glow. Using products from the incomparable Pat McGrath Labs, Moani added a hint of shimmer to the eyes paired with a touch of black eyeliner, mile long lashes and the prettiest of pink pouts. Lee shared all of the key products she used to create this dazzling look (along with the techniques she used), and you can shop them all here to recreate your very own country queen glamour at home. Using the MTHRSHP SUBLIMINAL PLATINUM BRONZE EYESHADOW PALETTE (1), press ‘PROVOCATRIX’ and ‘CELESTIAL’ onto the center of the lid. Sweep ‘BURNING DESIRE’ through the crease with a blending brush. Define the socket & outer corner with ‘DARK PARADISE’ & blend the edges. Use a small detail brush to apply ‘BURNING DESIRE’ along the lower lash line.